The Judicial power of the United States shall not be construed to extend to any suit in law or equity, commenced or prosecuted against one on the United States by Citizens of another State, or by Citizens or Subjects of any Foreign State. The Electors shall meet in their respective states and vote by ballot for President and Vice-President, one of whom, at least, shall not be an inhabitant of the same state with themselves; they shall name in their ballots the person voted for as President, and in distinct ballots the person voted for as VicePresident, and they shall make distinct lists of all persons voted for as President, and of all persons voted for as VicePresident, and of the number of votes for each, which lists they shall sign and certify, and transmit sealed to the seat of the government of the United States, directed to the President of the Senate;—The President of the Senate shall, in the presence of the Senate and House of Representatives, open all the certificates and the votes shall then be counted;—The person having the greatest Number of votes for President, shall be the President, if such number be a majority of the whole number of Electors appointed; and if no person have such majority, then from the persons having the highest numbers not exceeding three on the list of those voted for as President, the House of Representatives shall choose immediately, by ballot, the President. But in choosing the President, the votes shall be taken by states, the representation from each state having one vote; a quorum for this purpose shall consist of a member or members from two-thirds of the states, and a majority of all the states shall be necessary to a choice. And if the House of Representatives shall not choose a President whenever the right of choice shall devolve upon them, before the fourth day of March next following, then the Vice-President shall act as President, as in the case of the death or other constitutional disability of the President—The person having the greatest number of votes as Vice-President, shall be the Vice-President, if such number be a majority of the whole number of Electors appointed, and if no person have a majority, then from the two highest numbers on the list, the Senate shall choose the Vice-President; a quorum for the purpose shall consist of two-thirds of the whole number of Senators, and a majority of the whole number shall be necessary to a choice. But no person constitutionally ineligible to the office of President shall be eligible to that of Vice President of the United States. SECTION. 2. Representatives shall be apportioned among the several States according to their respective numbers, counting the whole number of persons in each State, excluding Indians not taxed. But when the right to vote at any election for the choice of electors for President and Vice President of the United States, Representatives in Congress, the Executive and Judicial officers of a State, or the members of the Legislature thereof, is denied to any of the male inhabitants of such State, being twenty-one years of age, and citizens of the United States, or in any way abridged, except for participation in rebellion, or other crime, the basis of representation therein shall be reduced in the proportion which the number of such male citizens shall bear to the whole number of male citizens twentyone years of age in such State. SECTION. 3. If, at the time fixed for the beginning of the term of the President, the President elect shall have died, the VicePresident elect shall become President. If a President shall not have been chosen before the time fixed for the beginning of his term, or if the President elect shall have failed to qualify, then the Vice President elect shall act as President until a President shall have qualified; and the Congress may by law provide for the case wherein neither a President elect nor a Vice President elect shall have qualified, declaring who shall then act as President, or the manner in which one who is to act shall be selected, and such person shall act accordingly until a President or Vice President shall have qualified. SECTION. 1. No person shall be elected to the office of the President more than twice, and no person who has held the office of President, or acted as President, for more than two years of a term to which some other person was elected President shall be elected to the office of the President more than once. But this Article shall not apply to any person holding the office of President, when this Article was proposed by the Congress, and shall not prevent any person who may be holding the office of President, or acting as President, during the term within which this Article becomes operative from holding the office of President or acting as President during the remainder of such term. SECTION. 1. The District constituting the seat of Government of the United States shall appoint in such manner as the Congress may direct: A number of electors of President and Vice President equal to the whole number of Senators and Representatives in Congress to which the District would be entitled if it were a State, but in no event more than the least populous State; they shall be in addition to those appointed by the States, but they shall be considered, for the purposes of the election of President and Vice President, to be electors appointed by a State; and they shall meet in the District and perform such duties as provided by the twelfth article of amendment. SECTION. 3. Whenever the President transmits to the President pro tempore of the Senate and the Speaker of the House of Representatives has written declaration that he is unable to discharge the powers and duties of his office, and until he transmits to them a written declaration to the contrary, such powers and duties shall be discharged by the Vice President as Acting President. 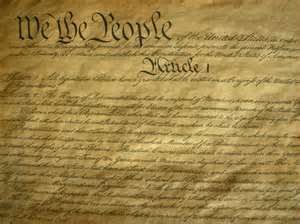 This text of the Constitution is a transcription of the document in its original form. Hypelinks will be added as related posts become part of this site. For a transcription with hyperlinks that show how sections of the Constitution have been superseded by Amendment view the US Government Archives Constitution.